Suspected bomber Yassin Hassan Omar is being questioned in London over the failed July 21 attacks after his arrest in Birmingham, police have confirmed. A Taser stun gun was used by officers arresting Omar, 21 - suspected of the attack near Warren Street Tube station - who was found alone in a house. Police stressed they were still looking for three other men over the attacks. Officers also raided a house in Stockwell, arresting three women, police confirmed. Police raided a ground floor flat at Blair House, which is 200 yards from Stockwell Tube station in south London, at about 1800BST (1700GMT). Police said three women from the Stockwell area were arrested on suspicion of harbouring offenders. "They have been taken to a central London police station, where they remain in custody. The arrests are in connection with the ongoing investigations into the events of 21 July," a police spokeswoman said. The front of the flat was later covered up with a blue tarpaulin, and the police are continuing their investigation. 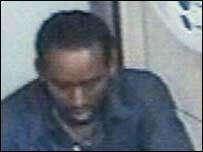 On Wednesday, police also released a second picture of a man they suspect attempted to bomb a Tube at Shepherd's Bush on 21 July. 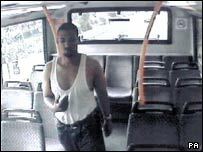 The unidentified man was pictured on a bus after the attempt. Omar was arrested in Heybarnes Road, in the Small Heath area of Birmingham, at 0430 BST on Wednesday, and later taken to London's high-security Paddington Green police station. It is believed a rucksack Omar was carrying at the time of his arrest was thrown out of a window by officers. "There was no intelligence to suggest that there were explosives in the house but local residents were evacuated as a precaution," deputy assistant commissioner Peter Clarke said, as a detailed forensic examination continued. "This of course is an important development in the investigation. "However, I must stress how important it is for the public to remain watchful and alert. "We are still looking for the other three men whose pictures we have released and who we believe tried to set off bombs on 21 July," DAC Clarke said. He praised the help from the public in "driving forward this investigation" into both 7 and 21 July attacks. He said the identities of two of the men had not yet been confirmed. Police had previously named Ibrahim Muktar Said, 27 - also known as Muktar Mohammed Said - as a suspect from the attempted bomb on the Number 26 bus. DAC Clarke released a second picture of the Shepherd's Bush suspect on Wednesday. The first picture had shown him at Westbourne Park Tube station wearing a short-sleeved dark blue England football shirt and dark trousers. After the failed bombing, he ran from Shepherd's Bush station, and police believe he threw away the shirt, possibly in MacFarlane Road, about 1230 BST. He was later pictured wearing a white vest on the Number 220 bus about 1320 BST, which he travelled on to Wandsworth, getting off at 1407 BST. "I must emphasise that until these men are arrested, they remain a threat," Mr Clarke said. After a day of other arrests and searches in London and Birmingham, armed police raided an address in Stockwell, south London, on Wednesday evening. Scotland Yard has confirmed the raid was in connection with the attempted bombings of 21 July and said the residential property was being searched. Footage is shown on US television of an X-ray of a bomb found at Luton railway station after the 7 July bombs in London. Prime Minister Tony Blair described the Birmingham arrests as "an important development". In Birmingham, shortly after Omar was arrested, a further three men were detained at a separate address and were being held in the city. Omar's detention followed a joint operation between West Midlands Police and officers from the Metropolitan Police Anti-Terrorist Branch. A second address in Bankdale Road, in Ward End, Birmingham, was raided a little later, and three men were arrested under the Terrorism Act 2000. Mr Blair praised the police for their efforts, saying they have "been working extraordinarily hard on this and have shown a tremendous amount of commitment and dedication to the task in hand". "I think it is an important development," he added. US broadcaster ABC News has shown exclusive photographs of bombs found at Luton railway station following the 7 July attacks, including an X-ray of one with nails sticking out of a bottle-shaped object. 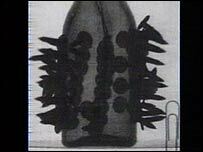 It also had images of the inside of the trains damaged by bombs at Edgware Road and King's Cross on 7 July. Meanwhile, a flat in north London linked to two of the 21 July suspects is being searched, and police say chemicals found there and in a garage may have been intended for use in explosives. Police have linked Omar and Ibrahim Muktar Said to the flat in the 12-storey Curtis House, in Ladderswood Way, New Southgate. All journeys started between 12:20 and 12:25. Times approx. OVAL: Man boards northbound Northern Line train at Stockwell and tries to set off bomb between Stockwell and Oval, where he leaves the train. He is chased out of the station at 1235 BST, but escapes towards Brixton. HACKNEY: Man, identified by police as Ibrahim Muktar Said - or Muktar Mohammed Said - also sets off from Stockwell. Boards Number 26 bus at 1253 at Bank. Police believe he was carrying bomb in a grey and black rucksack, and tried to detonate bomb while on board. Gets off in Hackney Road, near junction with Columbia Road, at 1306. WARREN STREET: Man who police believe is Yassin Hassan Omar boards Tube train at Stockwell carrying a purple rucksack that they say contained a bomb. Later tries to set off bomb on a northbound Victoria Line train between Oxford Circus and Warren Street, detectives say. Seen without rucksack at 1240 in Warren Street Station before running towards exit and vaulting over ticket barriers. SHEPHERD'S BUSH: Man wearing dark blue baseball cap and carrying small rucksack enters Westbourne Park Tube station and gets a train travelling towards Shepherd's Bush on Hammersmith & City Line. Tries to set off bomb at 1225 before escaping, probably through window at the end of the carriage, and running along the tracks.